Hello again! I meant to have this post up yesterday, but I got a lovely soccer related injury and spent the rest of my night resting (and icing and compression and elevation) and attempting to find a pair of crutches. Crutches have been acquired, so now I can finally get this post up! 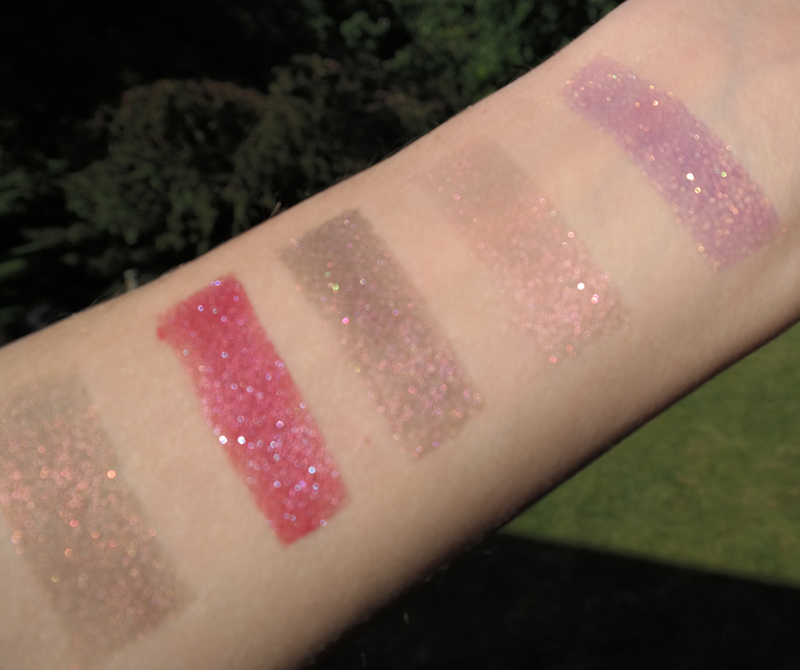 The next in my indie obsession month is Darling Girl Cosmetics. Darling Girl is an indie shop that is based out of Houston, TX and can lay claim to having an extremely popular item: The Darling Girl Glitter Glue. I did not get that in my order, but it's basically just as popular as Fyrinnae's Pixie Epoxy (which I will actually get around to writing about one of these days, I have so many more blog posts to do for Indie month... it's kind of ridiculous). For this order, I picked up their offering of the blogger pack. 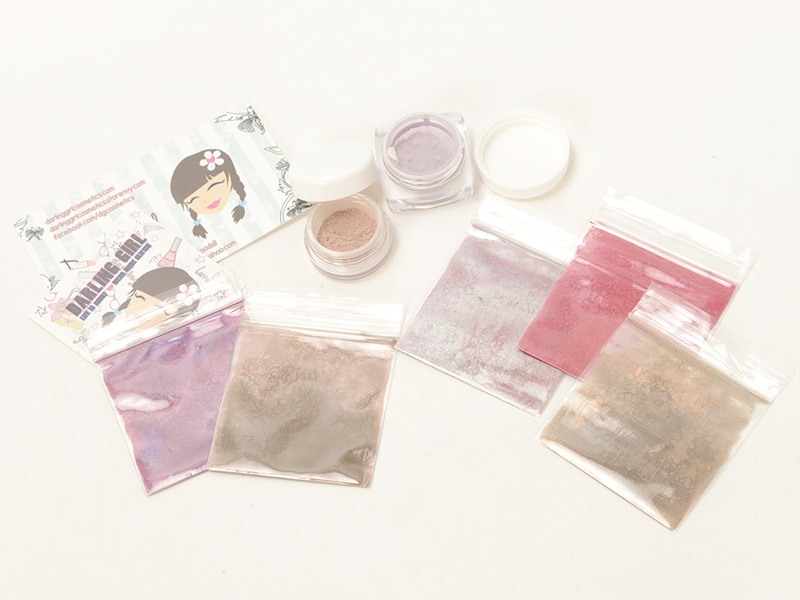 The blogger pack comes with one petite eye shadow and four sample baggies, but I believe that I also got a GWP and another little free sample baggie (and stickers!). The shades that I ordered were Persuasion, Beast, Frankenstein, Ruby Soho, and Blue Flame; the shades that were free were Wackadoodle and Mischievous. Now, as I've stated with the other indie reviews, shipping times really vary from company to company. However, every good company should have a stated TAT (turn around time) on their home page or on the order page. Darling Girl has a TAT of 18-20 days and my order took those 18-20 days, but it's a one woman show over there, so it's not something of concern for me. Now, on to the swatches! 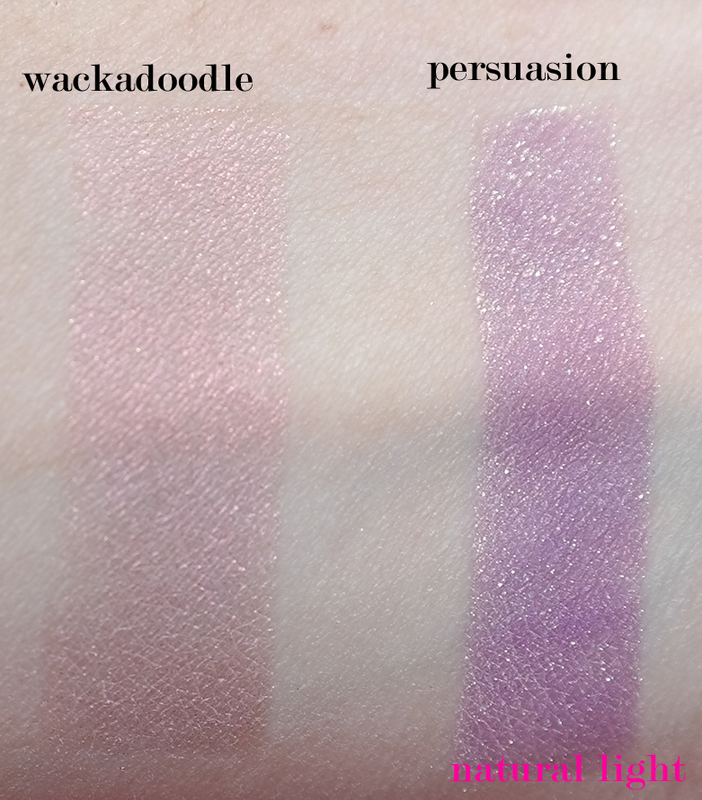 The shadows all apply very nicely and the only one that isn't extremely pigmented is Wackadoodle, but I'm 99% sure that it is meant to be a sheer (or at least, MORE sheer) shade. When I applied it to my eyes, I put it over a sticky bronze base and it look fantastic over that. 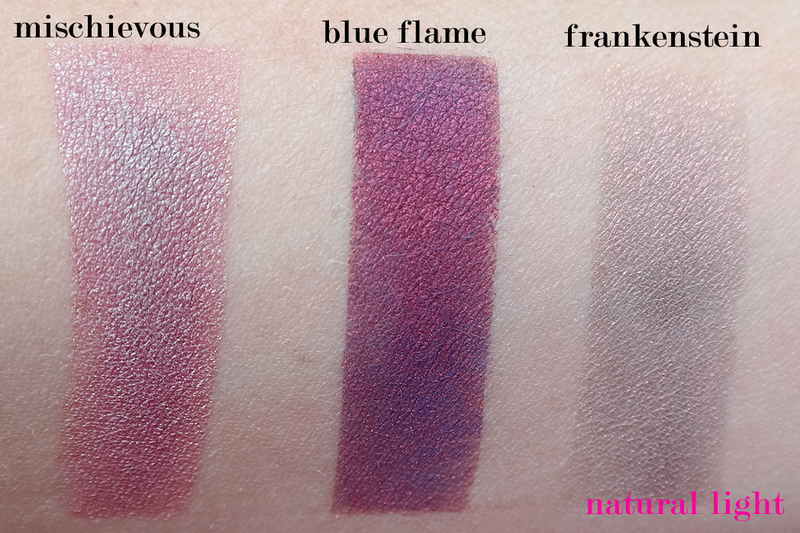 I don't know if you guys are as in love with Blue Flame as I am, but I kind of want to drown myself in the color. I mean really, how gorgeous is that?? The only thing that is a bit irritating to me is that Beast and Frankenstein look almost identical. It's probably not as obvious in the photos, but in real life, I can't tell the samples apart and when I put them on my arm, I wasn't completely sure that I hadn't swatched the same thing twice. 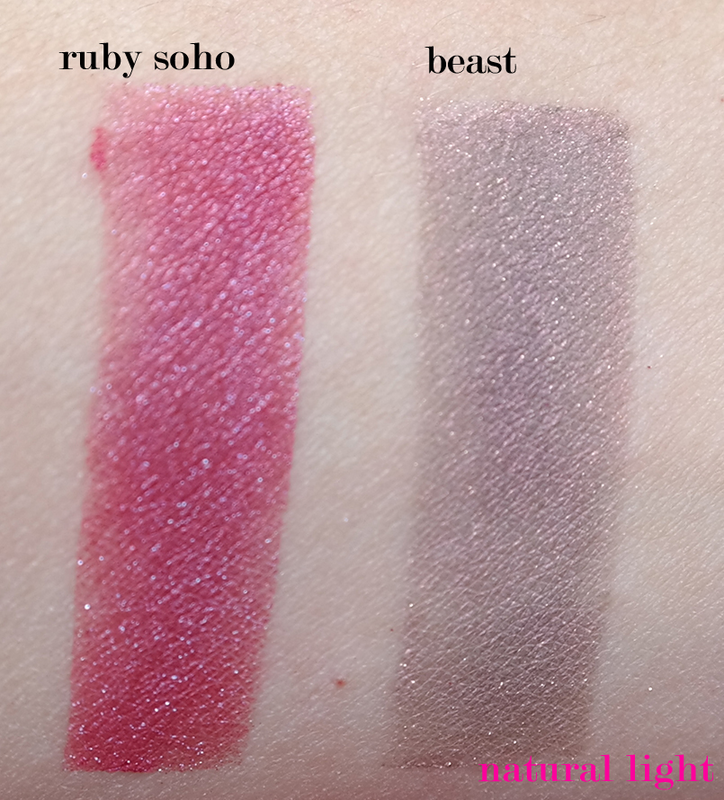 I had to go back and swatch them on my other arm just to make sure... Their descriptions don't sound that similar online either; Beast: Midtonal grey brown with red sheen and gold iridescence and Frankenstein: Murky greyish green with strong copper shift. I don't mind all that much since these are samples, but I just found it odd that they are so similar. 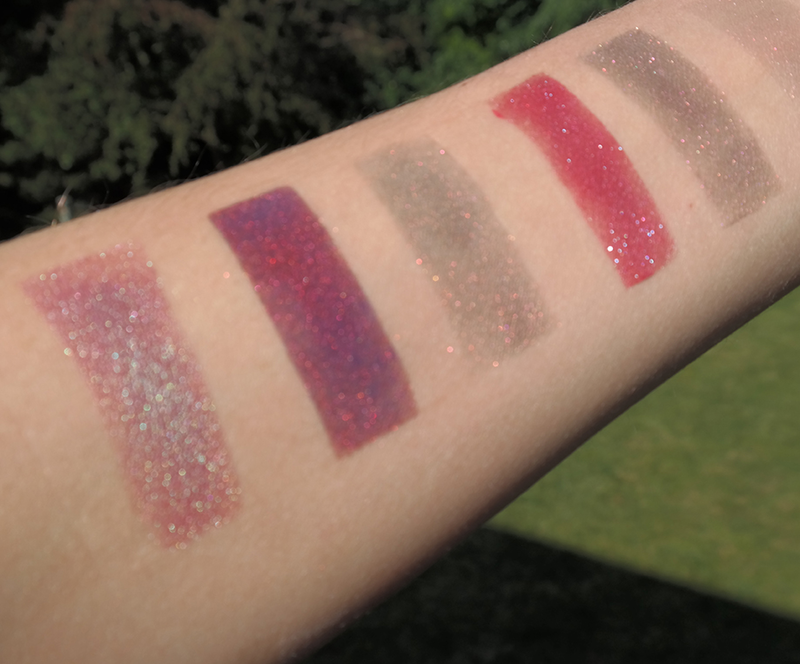 I am going to leave you guys with some out of focus snaps so that you can truly see the amazing sparkle in these shadows! Questions, comments? Leave them for me down below!